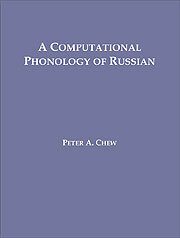 This dissertation provides a coherent, synchronic, broad-coverage, generative phonology of Russian. I test the grammar empirically in a number of ways to determine its goodness of fit to Russian. In taking this approach, I aim to avoid making untested (or even incoherent) generalizations based on only a handful of examples. In most cases, the tests show that there are exceptions to the theory, but at least we know what the exceptions are, a baseline is set against which future theories can be measured, and in most cases the percentage of exceptional cases is reduced to below 5%. The principal theoretical outcomes of the work are as follows. First, I show that all of the phonological or morphophonological processes reviewed can be described by a grammar no more powerful than context-free. Secondly, I exploit probabilistic constraints in the syllable structure grammar to explain why constraints on word-marginal onsets and codas are weaker than on word-internal onsets and codas. I argue that the features [+/- initial] and [+/- final], and extraprosodicity, are unnecessary for this purpose. Third, I claim that /v/ should be lexically unspecified for the feature [+/- sonorant], and that the syllable structure grammar should fill in the relevant specification based on its distribution. This allows a neat explanation of the voicing assimilation properties of /v/, driven by phonotactics. Fourth, I argue that jers in Russian should be regarded as morphological objects, not segments in the phonological inventory. Testing the grammar suggests that while epenthesis cannot be regarded as a major factor in explaining vowel-zero alternations, it might be used to explain a significant minority of cases. Fifth, I suggest that stress assignment in Russian is essentially context-free, resulting from the intersection of morphological and syllable structure constraints. I show that my account of stress assignment is simpler than, but just as general as, the best of the three existing theories tested. Finally, this dissertation provides new insight into the nature and structure of the Russian morphological lexicon. An appendix of 1,094 morphemes and 1,509 allomorphs is provided, with accentual and jer-related morphological information systematically included.